LIMITED ADMISSION FOR ONLY 60 GUESTS. In a one-of-a-kind intimate setting. See Master Concert Guitarist ESTEBAN and Bohemian Improv Violinist TERESA JOYperform a classic show, up close and intimate. The experience you will have is unlike anything you will have elsewhere. This will be a performance you don’t want to miss! Q & A and VIP Meet & Greet following the show. From that moment on, he focused on the guitar, teaching himself to play and practicing every spare moment. Esteban’s dream was to be able to express his deep inner feelings through his music. He wanted to study with legendary classical guitarist Andres Segovia, but being self-taught, it seemed impossible, since Segovia only accepted students of other classical guitarists, in the traditional settings of master classes. So, he gave up on that quest for a while, attended college, and graduated from Carnegie Mellon University in 1972, majoring in guitar and English literature. 1968, his first year at university, was the first-year guitar was offered at Carnegie Mellon, and the guitar teacher was a cellist with the Pittsburgh Symphony. He really was not an accomplished guitarist, so Esteban was basically on his own once again, teaching himself. 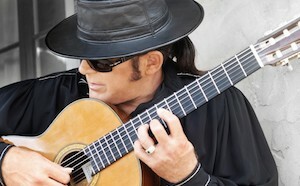 He stunned the juries with his amazing self-taught technique, playing his own compositions and performing the Spanish gypsy flamenco-style guitar.